1 lb. 5 oz. (600 g), FREE Shipping in USA, $8/bottle internationally. A Vet Code is required to purchase this item. Per FDA guidelines to purchase certain veterinary exclusive products you must either show that you have your veterinarian's approval by entering their unique vet code (go back to enter the code) or by requesting their approval using the form below. 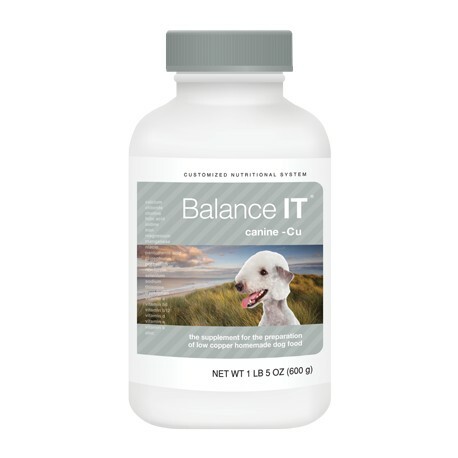 PLEASE NOTE that Balance IT® all-in-one supplements do not come with general use instructions. The amount to use is based on what is fed not just body weight. Use instructions can come from your veterinarian directly OR from a FREE recipe created with the Autobalancer EZ For Vet Patients tool (see Homemade Food tab or www.vet.balance.it) OR from your veterinary nutritionist (see bottom link under Help tab). (Your email address will also be your username. Please enter a valid email address as a validation email will be sent to it for you to follow to verify your new account. You will have 14 days to use your account without validating it. After 14 days, if your account is still not validated, it will be disabled until it is validated. If you haven't received our validation email within 24 hours of signing up, please send an email to info@balanceit.com using the email address on your account and request that we validate it for you. We will then validate your account as soon as possible during our business hours. Please fill out the fields below to request your veterinarian's approval. This process can take up to 3 business days. If you do not wish to wait, you can obtain a vet code from your veterinarian if they have an account with us. If your veterinarian does not have an account, or you don't know if they do, please fill out the fields below. If we are unable to contact your veterinarian due to the information you provided, then we cannot send an approval request. Must be valid FAX number with area code. Please do NOT enter a telephone number to call instead (find the fax number) as it will NOT work with this automated FAX system. Vitamin, mineral, and amino acid powder to create lower copper homemade dog food. Just mix with fresh foods you like to feed and your dog enjoys. 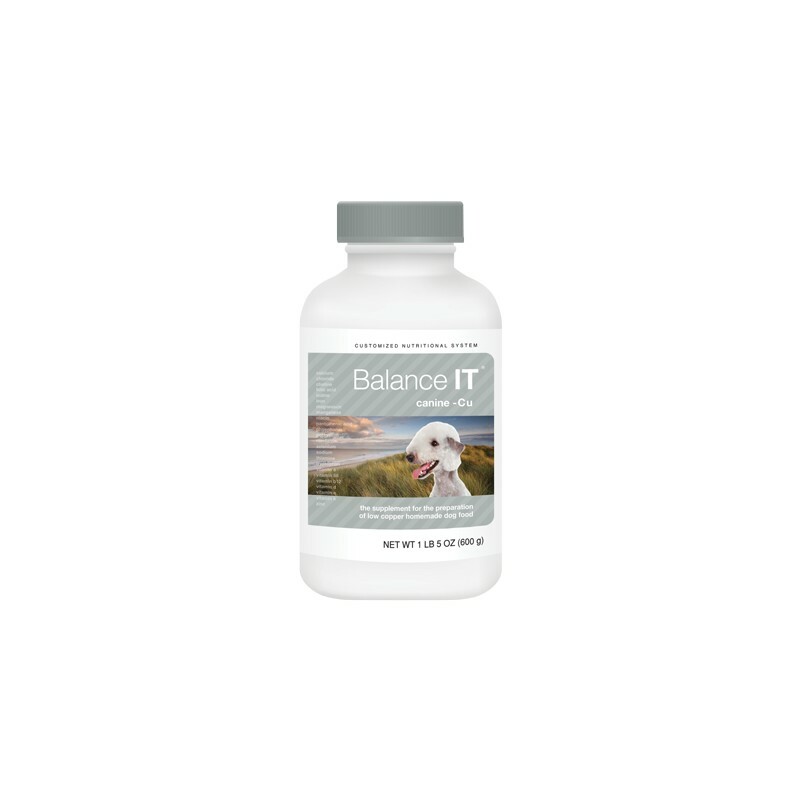 Click here to learn more about Balance IT® features & benefits. One bottle contains 21.16 ounces (600 grams) of powder. The dose of supplement is based on what is fed not solely body weight. Please use the FREE Autobalancer EZ tools under the Homemade Food tab to create custom recipes instantly. Balance IT® Canine -Cu is measured in teaspoons. Vitamin containing foods and supplements are perishable. Vitamins naturally degrade with time and the rate at which they degrade is increased when in the presence of trace minerals. We account for this inherent degradation with our formulations to ensure that there are extra vitamins present when first made. These “overages" enable the vitamin minimum guarantees to be met at the end of the product’s shelf-life. Unfortunately, for some vitamins (e.g., vitamin D for dogs especially) there are safe limits to how much extra vitamin can be added without risking a nutrient excess when first made and then used. Consequently, 12 months is the maximum amount of shelf-life one can typically achieve safely and consistently. Since we take the extra step of assaying certain key nutrients after production using a third-party laboratory, the longest shelf-life we ever might have is 11 months (since it can take a month for shipping, testing, and packaging). We also make every effort to never have product ship with less than three months left on its expiration date as this ensures that the average user will use the entire bottle before it expires (the average size dog on the average recipe uses about 600 grams a month, for specific use rates please see the recipe). Click here to view the PDF of the actual label. Copyright © 2011-2018 DVM Consulting, Inc. All rights reserved. This product and the supporting formulation software are not designed or sold for use in the production of any commercial pet food (i.e., any food prepared and then sold to someone else). INGREDIENTS: Tricalcium Phosphate, Potassium Citrate, Powdered Cellulose, Choline Bitartrate, Monopotassium Phosphate, Magnesium Sulfate, Sodium Bicarbonate, Potassium Chloride, L-Tryptophan, Vitamin E Supplement, Zinc Sulfate, Ferrous Sulfate, Phylloquinone (Source of Vitamin K Activity), Vitamin A Supplement, Potassium Iodide, Manganese Sulfate, Niacin Supplement, Calcium Pantothenate, Vitamin D2 Supplement, Riboflavin, Vitamin B12 Supplement, Sodium Selenite, Thiamine Mononitrate, Pyridoxine Hydrochloride (Source of Vitamin B6), Folic Acid..